Friday 14th - Oh Boy! ABC-TV's Saturday evening teenage show "Oh Boy!" may follow in the footsteps of its television rival "6.5 Special" in being adapted for the cinema screen. Talks are currently in progress for the making of an "Oh Boy!" film at the ABC studios in Elstree. It would be a full-length feature film, probably with a story-line, as was the film version of "6.5 Special" which proved a big box-office attraction. If details are concluded, the film will be directed by Duke Goldstone, one-time director of the Liberace telefilms, who is new in this country directing the Mantovani telefilms. He visited the TV studio two weeks ago when Tommy Steele appeared. Latest booking for the "Oh Boy!" TV show is American rock singer Vince Taylor, who came to Britain to seek success. 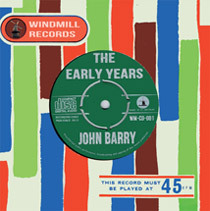 He cut his first record last week for Parlophone, "Right Behind You Baby" for release on November 28. NME reports that Marty Wilde wants to end his contract with manager Larry Parnes. Marty Wilde was deeply upset with Parnes' decision to pull him out of the”Oh Boy!” series and within just 4 weeks of his final 18th October appearance was consulting lawyers with a view to terminating his contract. Marty had always enjoyed a good working relationship with Jack Good and he believed it was only Parnes who was putting ‘flies in the ointment’ and creating difficulties. Jack Good himself held Marty in high esteem and was keen for him to return to the fold, which he did eventually on 7th February 1959. Once back Jack promptly secured Marty by signing him up to appear in 12 or the remaining 17 shows of the series. Indeed he made Marty both host and star attraction for his subsequent TV series “Boy Meets Girl” which aired for 6 months from September 1959 to March 1960. Dynamic Marty Wilde is seeking release from his contract with artists' manager Larry Parnes "for personal reasons" - though the agreement is still valid for a further three years. Marty told the NME: "My father is consulting our solicitors about legal aspects of the contracts. I will go ahead with the dates Larry has arranged, including variety, concerts and pantomime at Stockton."